So, since I wrote about one of our best selling eyeshadows, Chocolate, yesterday, I figured I should show you how I wear it. It's a staple in my rotation and I love to wear it in the day time. 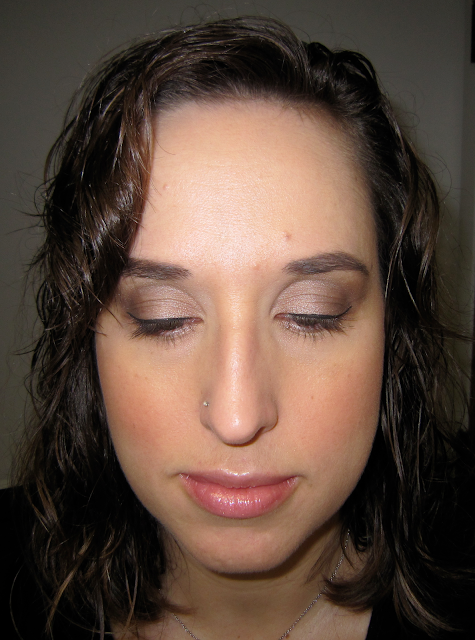 It's a good neutral color that it super versatile. I have Silk under my brow and on the inner half of my lid. Then I blend Chocolate out really well on the outer half of my lid. I love the subtle glow of brownish/purple. I am also wearing the barest hint of Plummy as a blush, and Beige foundation. I use Brunette to fill in my brows. *Show us how you wear Beauty Bliss Cosmetics! Send a picture and description/list of your colors to admin(AT)beautyblisscosmetics(DOT)com.